For a low volume and hand fed one sided forms application, the most advanced OMR scanner on the market today is the Sekonic SR3500. It has an automated data capture of up to 3500 sheets per hour for accuracy and cost effectiveness. The Sekonic SR 3500 Hardware scans and processes data from surveys, tests and other office forms. The Hardware is combined with an OMR reader to recognize filled-in optical marks (bubbles and checkboxes) on forms, which automates the data collection process. This software gives you the great data collection, survey tabulation and test grading features of Remark Office OMR, but works with traditional OMR readers and pre-printed forms from NCS, Sekonic, Scantron, Chatsworth Data and Apperson Print Management. Markings: Standard model: Number 2 pencil carbon based print ribbon or punched hole. Optional ink read model: Reads all marks in any color other than reds, including marks made with a ballpoint pen and most felt tip markers. Data Marks: 48 channel, up to 140 rows per side. Read system: Optical reflection system. The same reflective read head is used as the SR-600/730 and 2300 models. Note: This mark recognition system is adopted so rough check marks as well as usual bubble marks can be read. Effective Transport speed: Up to 3,500 documents per hour. Mark Detection Format: Can emulate SR-600, SR-700 and density output type scanners. RS-232C serial (9 pins), baud rates 9,600 to 115,200. Power Source: AC 100V to 220V. 50Hz / 60Hz frequency. Environment: Temperature: 41-95°F (5-35°C); 30-80% relative humidity. Self-test: Checks sheet detection sensors and system data memory. Read system test (reading test) included. OMR Solutions is a Sales and Support Office of Sekonic Optical Mark Reader (OMR) scanners. Powerful, automated data capture at 3500 sheets per hour/15 cards per minute will save you hours of data entry time. Data entry goes from days to minutes and accuracy is increased. 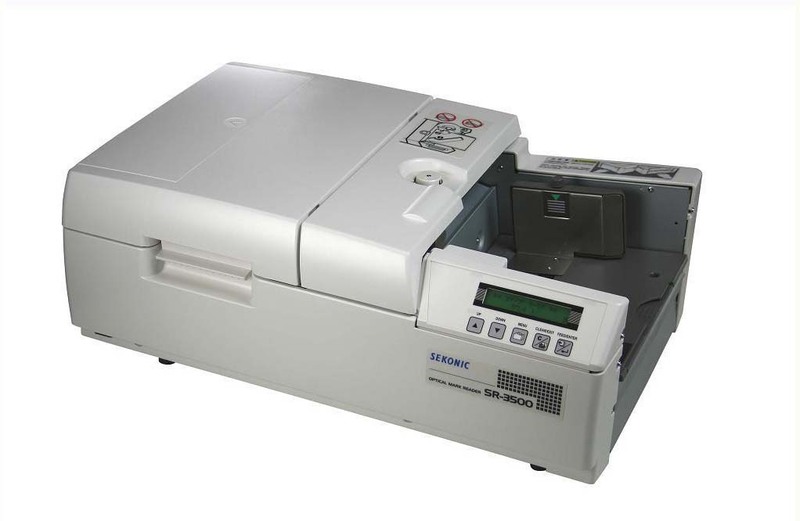 A Sekonic optical mark reader is fast, reliable and cost effective. The functional + below-mentioned function of SR-3500 addition--- High speed processing 3500/actualizing the time Reading adopting a new technology for processing. Marks in data both sides reading type preparation. (DUPLEX READING) Input job time was shortened more. High The selection stacker which is convenient to re-check In stacker, reading OK seat (lower position) with reading NG or misprint entrance seat (upper tier) Being automatic, the distribution. It can depend on same re-check. Education Institutions (Universities, Schools, Coaching Institutes & Educational Consultants etc). Fortune 500 Companies (For HR Inhouse Survey and Quality Surveys,Customer Satisfaction Surveys etc and Recuitment. Non-Profit Organisations and many more. Sekonic SR 3500 ® Optical Mark Reader has remarkable reading performance and it is touted to be the most User-Friendly optical mark reader in the market today.The Advance Hardware Designs Guarantees smooth and efficient scanning of OMR Forms.